A favourite with the first time visitor, the holiday pulls together the touring highlights of this beautiful country leaving a few days free to explore yourselves or add extra tours. 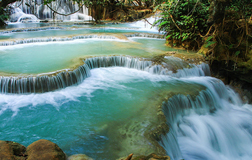 The joy of Vietnam as a touring destination lies in its long shape stretching up from the lush, green, tropical south right up to the mountainous, more temperate north, to reveal a land of invigorating landscapes, beautiful coastlines and a compelling history that twists and turns as you make your way up or down. As ever if you’d like to slow it down or speed it up please ask! Day 6: Morning cruise then fly to Hue for 2 nights. 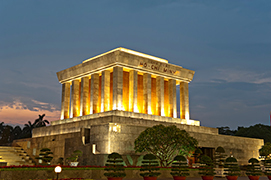 Depart on a choice of overnight flights to Hanoi. 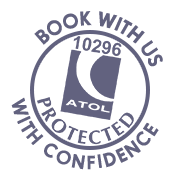 On arrival you’ll be met by your private guide and transferred to the city centre where you check in to your choice of hotel for 3 nights. 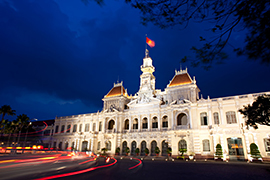 Hanoi offers the chance to enjoy authentic old school Far East. The hotel is in the centre and we’d recommend that you take a walk through the Old Quarter. Don’t be put off by the thousands of motor scooters, just dive in. After breakfast you’ll be collected for a small group full day city tour. The day kicks off at Ho Chi Minh’s mausoleum where you join thousands of Vietnamese as they pay their respects filing past in solemn silence. 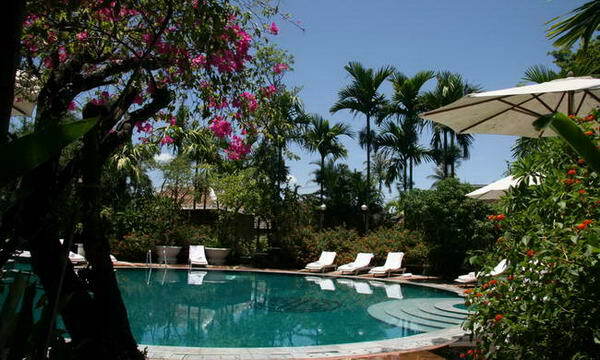 The complex is also home to his former stilt-house, Presidential Palace and One Pillar Pagoda. From here you walk a short distance to the archaeological site of the Imperial Citadel of Thang Long. The Citadel was built in the 11th century by the Ly Viet Dynasty and was the centre of regional political power for almost 13 centuries without interruption. Its history will be explained as you explore the site. After this, break for lunch in a lovely local restaurant. The afternoon starts at the Temple of Literature, Hanoi’s first university. Originally built as a temple dedicated to Confucius, it became the site of Vietnam’s first university dating back to 1070. Then you’re off to Hanoi’s Old Quarter where you’ll visit Long Bien Bridge that was built between 1899 - 1902, whilst under French occupancy. Your guide will take you across to the other side where you can see how close Hanoi is to countryside life. Back in the Old Quarter enjoy an hour’s exploration aboard a cyclo (Vietnamese cycle rickshaw). Also known as the 36 streets, this bustling warren of narrow streets is home to thousands of small businesses, including galleries, craft shops and restaurants. End your day with a Vietnamese coffee in a local café overlooking Hoan Kiem Lake. Here you can spend some quality time with your guide and ask him questions about all the sights you have seen throughout the day. You will return to your hotel at 4.30pm. A free day to explore Hanoi under your own steam. Hanoi life is generally very accessible to the visitor, as a lot is played out in the open and you should have a good orientation from yesterday’s tour. Start in the Old Quarter where the pace is intense, then spread out to find galleries, small shops, cafes and museums. Perhaps take another walk around Hoan Kiem Lake, especially before and after work when it serves as a focal point for public life, hosting Hanoians enjoying games, aerobics and just socialising. At 5pm you’ll be collected by your guide and taken with others on the evening Street Eats and Market Tour, a great introduction to Hanoi life. With food stalls on every corner Hanoi is famous for its street food cuisine and Bia Hoi, a draft beer that is brewed daily and sold on street corners. Start your evening at ‘Bia Hoi corner’; pull up a stool to taste the local brew and do a spot of people watching. 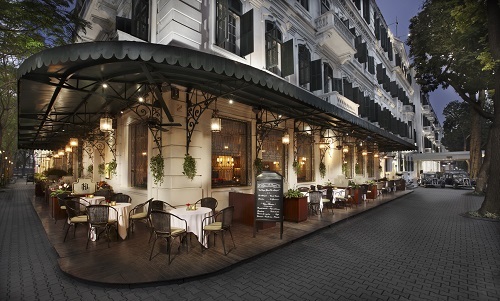 Then walk through the bustling streets of the Old Quarter as your guide introduces you to the various foods on offer. Stop at one of the many pop up restaurants and try a Vietnamese barbeque of flame grilled meats, tofu and vegetables on skewers just like the locals. End the evening with a walk along Hoan Kiem Lake for dessert at Hanoi’s most famous ice-cream street. This morning you’ll be transferred by minibus to Halong Bay (3.5/4 hours). Meet the crew and board the traditional wooden junk for 1 night, then relax and enjoy lunch while the boat heads toward the secluded islands. Visit ancient limestone caves and go sea kayaking and swimming (weather permitting). Return to the junk refreshed & invigorated to relax on deck with a drink watching the sunset and enjoy a seafood dinner under the stars. Enjoy breakfast as you continue to cruise through Bai Tu Long and visit the floating fishing village of Vong Vieng to learn more about daily life living on the bay. Cruise back to the dock whilst enjoying a light lunch for return drive to the city and onward flight to Hue. 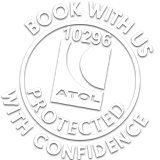 On arrival met and transferred to your hotel of choice for 2 nights. This morning your private guide will collect you for the tour to the Imperial Citadel, a UNESCO World Heritage site. Straddling the Perfume River, this was the Nguyen capital, the last dynasty in Vietnam. It dominates Hue and its moated walls protect the forbidden Purple City, the former home of the royal family that’s modelled on the Forbidden City in Beijing. 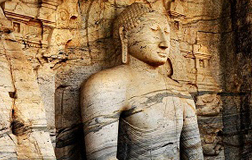 Take your time wandering through the fascinating tombs, temples and museums and past pagodas, lakes and pavilions. As you walk around you’ll also see the scars still visible from the Citadel’s prominent role during the Tet Offensive. You may also have time to visit the Minh Mang tomb, perhaps the most majestic of all Hue’s elaborate Nguyen mausoleums that are scattered around the countryside. Lunch will be at a local restaurant, then short cruise down Perfume River to Hue’s best-known religious site, the Thien Mu Pagoda. Built on a hill between the river and pine forest the distinctive seven-tiered octagonal tower is the focal point of the complex and is one of the oldest and most attractive in the country. 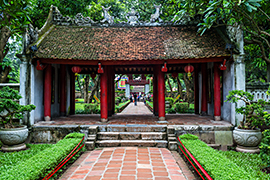 Continue through the working monastic complex to a beautifully kept garden and cemetery at the base of the Truong Son Mountains. Back at the hotel late afternoon. This evening perhaps take a walk through the small night market that runs through the town. This morning your guide will pick you up for the private car transfer to Hoi An via the dramatic Hai Van Pass, with plenty of time to stop and take some pictures looking down along the dramatic coastline. On arrival check in to your choice of hotel for 3 nights. Extra....Hoi An is also blessed with superb beaches and so you can choose to either stay on the beach or in town, depending on where you'd like to spend most of your time. If you’re here from March to September the weather should be perfect to enjoy the beach, why not extend for a few days? This morning your guide will collect you for a private walking tour of Hoi An’s Old Town. 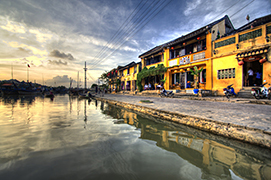 Hoi An grew up as a trading port that welcomed Chinese, Dutch, French, Japanese, Portuguese and Arab merchants between the 16th to 18th centuries. Today it's famous for its restored architecture, homemade silk, expert tailors and delicious noodles and seafood. Its relaxed vibe and pedestrian streets make this town a pleasure to walk around and discover new things. Historical highlights include the Chua Ong Pagoda dating back to 1653, the Jinshang Temple that is dedicated to the goddess of the sea and the protector of sailors, Tam Ky House a 200 year old ancestral house and the 17th century covered bridge built by Japanese craftsmen and is a major landmark of Hoi An. The historic streets also house some beautifully atmospheric restaurants and this evening we recommend that you come back for dinner, when the town is lit by lantern light. 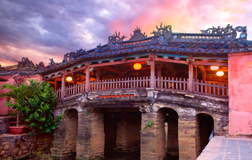 Hoi An is invariably a favourite with those travelling through Vietnam as it's so easy to explore the Old Town under your own steam or perhaps hading down to the beach. There are also a host of excursions we can offer, for example a cycling tour or the surrounding countryside or perhaps an informal cooking course in a beautiful setting. Private airport transfer and short flight south to Saigon. 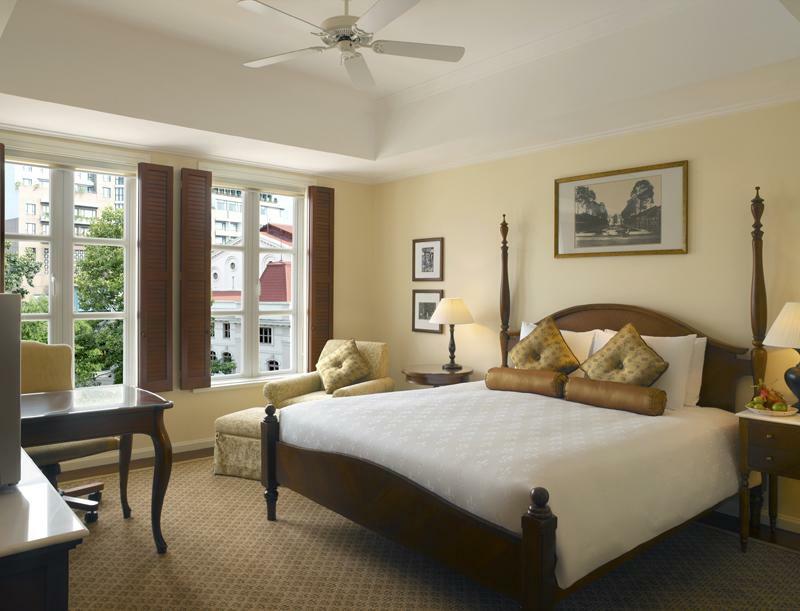 On arrival you will be met and transferred into the city centre where you check-in to your choice of hotel for 2 nights. The rest of the day is yours to get your first taste of this vibrant city. 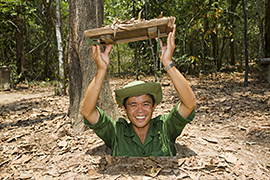 Early departure with your private guide to escape city traffic and get ahead of the crowds on a half day tour to the Cu Chi Tunnels, legendary remnants of the Vietnam War that offer an evocative insight into the horrors that were faced by those involved. During the guided tour it’s possible to descend into the layers of tunnels that although widened, still create a feeling of creeping claustrophobia. 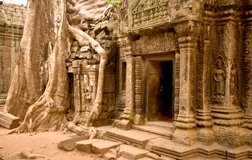 Few other places encapsulate the sheer will-power that the American military was up against - and the lengths that the Viet Cong were prepared to go to in order to evict them. 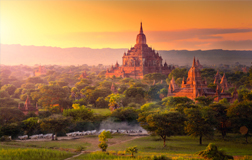 Back to the city for lunch in a local restaurant and then rejoin your private guide for an afternoon city tour Highlights include the colonial Notre Dame Cathedral, Old Post Office & Opera House, Reunification Palace and War Remnants Museum. Back at the hotel late afternoon. Your guide would be happy to make dinner arrangements. This morning you’ll be collected from the hotel lobby and driven south (with others) to the Mekong Delta where you board a boat to explore a less-visited area of the Mekong, home to luxuriant vegetation and lush coconut islands, as well as orchards and rice paddies. Visit a local coconut processing enterprise where this vital fruit is treated in the age-old way to separate oil, flesh and husk to be used in oil, matting and candy. After the boat ride you will be taken on a short walk to a small village to see mat weavers at work, before jumping on the delta’s version of a tuk tuk to travel down the country roads to the pier. Here you board Le Jarai, a beautiful teak boat and continue your cruise along the river. Whilst on board join in a demonstration of Vietnamese cooking before sitting down to a sumptuous three-course lunch of Mekong specialities. After lunch relax on the top deck and watch river life pass you by. Cruise back to Ben Tre where you’re transferred back to Saigon by early evening. 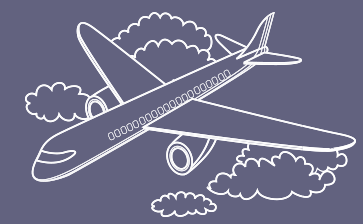 Day free until your airport transfer a flight home. Arrive back in UK the following morning.